Are you ready for a fun and productive summer with your kids? I’ll be posting fun-focused activities, that both you AND your kids will enjoy! To get the summer started right, simply gather some tools and set a schedule for reading and writing. DO NOT read or write today! Put it off. Plan it for tomorrow. Build some anticipation. Today you are focusing on setting the stage. We know that readers read and writers write. All YOU have to do is set aside time to do those things and sprinkle in some fun! That’s where I can help! Have your children make their own “stuff I want to read” signs with paper and markers. Gather a variety of interesting books that are buried on bookshelves, and get some from the library or a bookstore. You could even ask friends to do a book swap, exchanging favorite books for a couple of weeks. Provide some sticky notes to use for bookmarks and also to highlight interesting &/or confusing words or ideas. Place the stack in a box, basket or book bag. You can always add to this collection throughout the summer. Later, to combat waning interest, you might add items like stickers, photographs of your family doing fun things, colored pencils, and even a stick of gum to mail to Grandma. Don’t do this all at once though. Keep some motivation tucked away! 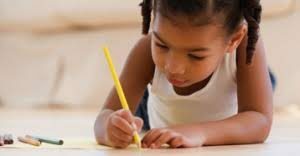 Also, when your kids write letters to loved ones, privately encourage those loved ones to write back and to include a dollar, a pixy stick, stickers, or anything else that they can think of to motivate your kids to write another letter or two! When you have created both a reading stack and a writing bin, create a plan together. In my house, even when my kids were in high school, we had a designated reading time. We ALL got our books, sat down together, and read for about an hour a few times a week. When our time came to an end, we took a few minutes to share with one another what we’d read. As I learned more about the importance of writing, we added that into our schedule, too. I bought my boys notebooks, and they wrote in them at least once a week. (I treasure these notebooks!) Usually, I read a simple book to them, and they wrote their own version using a similar format that the author used. Sometimes we were outside on the hammock. Sometimes we were spread around the living room. But we always made time for reading and writing. Schedule your reading and writing times with your kids, and commit to sticking with it. If it’s important to you, it’ll be important to them, too. And please don’t bribe your kids to do any of this. This IS the reward! Throughout the coming weeks, I’ll provide lots of tools, ideas, and fun-focused activities for you to promote reading and writing with your kids!